Congrats to Cayci and Trent who hosted a dream wedding in June 2016 – it began with a Destin beach wedding followed by a sunset reception on the SOLARIS yacht wedding venue. From beach to bay, they celebrated with the ultimate wedding in Destin Florida, using two of the most memorable wedding venues – the beach and a 125 foot yacht. The SunQuest wedding planners worked with Cayci and Trent from Nashville to make their dream wedding vision come to life. Having our team plan everything from the beach wedding in Destin to the yacht reception in Sandestin made it a seamless and stress free process. The beach wedding took place on a perfect June day near Sandpiper Cove in Destin Florida. Cayci stunned in a long length, sleeveless white gown with exquisite jewel details that accentuated her shoulders and shined brilliantly in the sun. The bridal party wore navy and white while the groom and groomsmen looked dapper in black tuxedos – all with their toes in the sand for the big day. The couple was married by Captain Matt of the SOLARIS yacht. After the Destin beach wedding, guests were transported to the Sandestin Golf and Beach Resort and boarded the 125 foot SOLARIS yacht for a sunset reception out at sea. I was a freshman at The University of Tennessee in Knoxville and had decided to rush a sorority. During this process the older girls tell you to hang around the dorm and not to be seen going out if its not for a rush event. Luckily I met girls in my dorm that were going through rush as well. One night they asked if I wanted to go over to their friend’s apartment from high school. I said yes, and we headed over to Grand Forest in our t-shirts and Nike shorts. I walked inside and met this tall, skinny, long blonde hair, green eyed guy named Trent. He had the biggest personality and the best smile! Little did I know that 9 years later, after many adventures together, I would be writing this story on our wedding website! Trent and I decided to take a trip to Gatlinburg for the weekend to relax and see the changing of the leaves. Saturday we woke up and headed to the top of The Smokey Mountains. We took a long drive up to Clingmans Dome and hiked to the top! After many stops to catch my breath, we made it to the top of the observation tower. We didn’t stay long because it was very windy and crowded. We decided to hike down to the Appalachian Trail to find a bluff, and boy did we get lucky! After sitting on the bluff and talking for a while, Trent scooted back a little. I asked him what was wrong and he said, “you know I don’t like heights.” My response was, “I was wondering how you had been sitting on the edge so long.” I asked if he wanted to hike down the trail a little further and find another bluff, he agreed. I got up and turned to walk and he was on one knee with THE ring! He had that smile I love and asked me to marry him! Of course we are both crying and all I can do is shake my head yes, at which point I realized I needed to use my words and said YES! 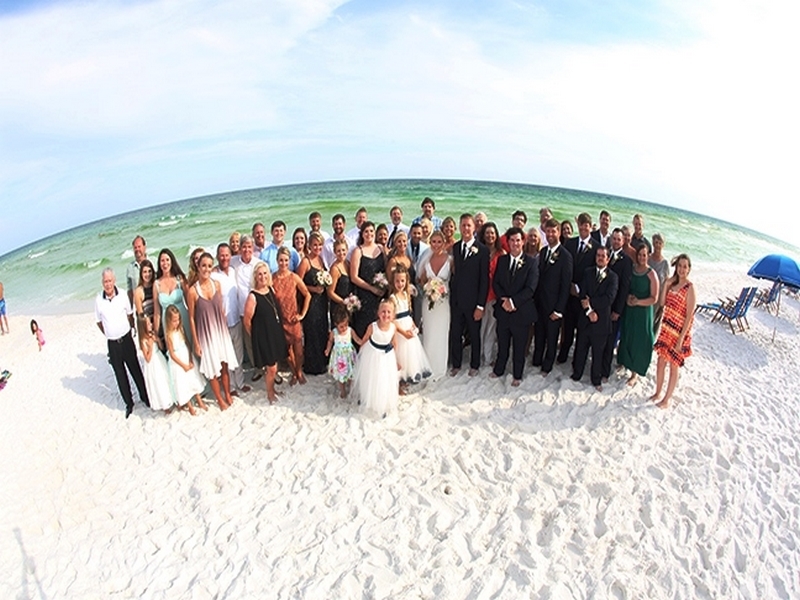 Contact our wedding planners today to discuss the Destin Beach Wedding of your dreams.